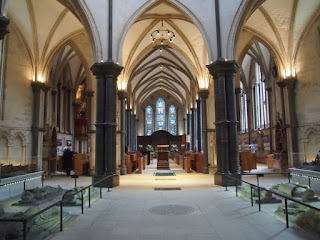 For those who have a deep and abiding interest in all things Knights Templar, check out the blog Flickering Lamps' entry on London's Temple Church from last February - particularly if you've never had the opportunity to visit it in person. It features many beautiful photographs of the church, especially the interior, and much history. The blog's author, "Caroline," lives in London and her site features a treasure trove of material on churches, cemeteries, castles, and many other historic sites, from the Bronze Age, through the medieval, gothic, renaissance, and neo-classical ages, right up to today. If you are traveling to London and intend on visiting the Temple Church, please be sure to visit the Church's official website HERE. Their hours can vary, special events can occur, and other circumstances can affect the chances of getting inside. More than one eager tourist has turned up from halfway around the world, only to find it closed. In fact, the website suggests that you specifically email the Verger directly at verger@templechurch.com or call him at 020 7353 3470.